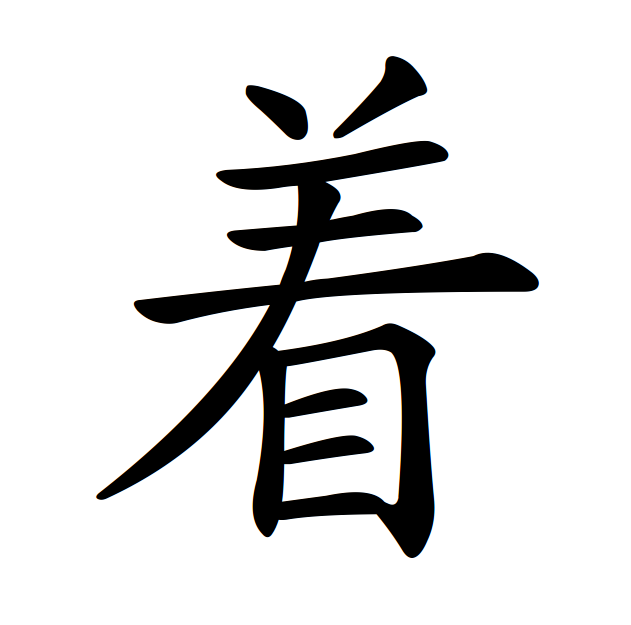 As many of you probably already know, there are two sets of Chinese characters: simplified and traditional. As the names imply, the former is a simplification of the latter. Character simplification was promoted in Mainland China from the 1950s and onwards, which explains why the traditional characters are still in use in many other places, including Taiwan, Hong Kong and many overseas communities.This article is not meant to detail the history, causes and effects of the simplification reform, but is instead meant to provide practically useful information as to how these things are handled in Skritter. Before we talk more about character simplification, it’s important to understand that most characters are the same in both systems and were never simplified so they are the same in both sets. It’s also good to know that many of the characters that were simplified were based on already existing short-hand versions of characters, so only some characters are actually new.Interestingly enough, there was actually a second round of simplification planned that did involve much more creative forms, but this was (fortunately) never implemented. Do you think it would have been easier to learn Chinese if we all learnt these characters instead? In total, around two thousand characters were simplified. A large majority of these can be learnt or understood easily by learning how a few components were changed. For example, 釒is turned into 钅, which affects all other characters containing this component (when it appears on the left as a radical). If you learn the rule, you know dozens of simplified characters, provided that you already know the traditional forms. The opposite is also mostly true, but ton in every case. For example, the 又 component in simplified Chinese has been used to replace a range of completely different components in traditional Chinese. Compare simplified 难 and 欢 to their traditional forms 難 and 歡. As you can see, you would not be able to predict the traditional form based on the simplified. Then there are cases that need to be studied and learnt on a case-by-case basis. There are some rules, but they are many and hard to predict how they are applied. The tricky cases comprise perhaps one fifth of the total number of simplified characters, but make up a majority of the time when switching character sets. The most difficult to learn are those that map to several characters in the other set. To understand this and how it works in Skritter, we need to look at character mappings. Then there are some unusual cases where it’s actually the other way around, meaning that there are several simplified characters corresponding to one single traditional character! Instead of having 1:2 mappings, we have 2:1 mappings, too. The most common case is 著 and 着, which in traditional Chines are always written as 著. You can find the remaining cases at the bottom of the article linked to above (this one). In Skritter, most character mappings are handled correctly (I work with this on a daily basis), meaning that in our database, which is based on simplified characters, each character can have more than one traditional character tied to it. These will be displayed next to the simplified character when you bring up information about the character (or word). Most of the time, this poses few problems. If there are any problems, such as if the wrong 台 has been used, this is easy to fix. There are a couple of things that can and do go wrong, though. First, many of the words in our database are user-generated. Since most learners use simplified characters when they add words or sentences, they neither see nor care about the traditional version. Therefore, we rely on automatic conversion between the two sets, a process that is hard to do 100% accurately. We fix such mistakes as soon as they are reported, so if you find any, do let us know! Second, we are unable to handle irregular mappings where more than one simplified character corresponds to one traditional character. This is rarely a problem except for the characters 著 and 着 mentioned above. This means that we can’t show the proper mapping, at least not right now. It also means that words containing these characters need to be entered with either the traditional character or the simplified one. Unfortunately, there will be no mapping between the two, so you need to add the one you actually want to study. As far as possible, we try to annotate these words, including a comment to the effect that a certain word is meant for traditional or simplified Chinese. As if the problem of character simplification wasn’t complicated enough for students and developers, there is also the problem of font variations. This means that even if a certain character is not simplified (i.e. there is only one entry for it), it might still be written differently. In Chinese, there are different standards for writing the same character. The picture on the right is borrowed from this article, where you can read more about font problems when learning Chinese. The picture shows the same character as written in Mainland China and Taiwan respectively. 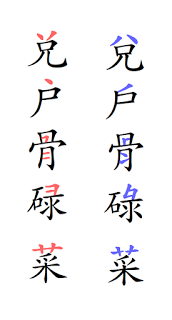 Note that these aren’t simplified characters, they are the same characters written differently! There are also differences between how the same character is written in Japanese and Chinese; read more about that here. Knowledge and understanding is the only weapon that works against these problems as a student. The problems are there and they won’t go away any time soon, but by knowing about them and being aware of the differences, you can still make sense of them. If you have any questions, leave a comment!